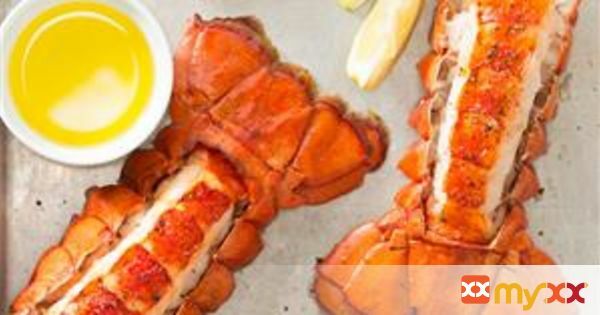 Easy, delicious lobster tail. See directions for special butters. 1. Preheat broiler. Using kitchen scissors, cut a 2-in.-wide rectangle from the top shell of each lobster tail; loosen from lobster meat and remove. 2. Pull away edges of remaining shell to release lobster meat from sides; pry meat loose from bottom shell, keeping tail end attached. Place in a foil-lined 15x10x1-in. pan. Arrange butter slices over lobster meat. 3. Broil 5-6 in. from heat until meat is opaque, 5-8 minutes. Season with salt and pepper to taste; serve with lemon wedges. 4. Recipe may be prepared using a compound herb butter in place of plain butter. To make compound butter, process 1/4 cup softened butter with fresh herbs and seasonings of choice in a small food processor. Transfer mixture to a sheet of waxed paper; roll into a log, then refrigerate until firm. To use, unwrap and cut into thin slices. Lemon-Chive Compound Butter: Add 2 tablespoons chopped fresh chives, 2 tablespoons chopped fresh parsley, 1 tablespoon minced shallot, 1 minced garlic clove, 1/2 teaspoon grated lemon peel and 1/4 teaspoon salt to butter. Chimichurri Compound Butter: Add 2 tablespoons chopped fresh cilantro, 2 tablespoons chopped fresh parsley, 1 tablespoon minced shallot, 1 teaspoon grated lemon peel, 1 teaspoon minced fresh oregano, 1 minced garlic clove, 1/4 teaspoon salt and 1/8 teaspoon crushed red pepper flakes to butter.